When it comes down to it, there are wayyy too many opinions for weapons and gear for the Blood Angels and their successors. In my mind, the battlefield role of these units are the key to equiping them. So what do we want? 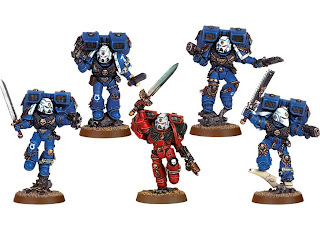 Jump Pack Death Company? 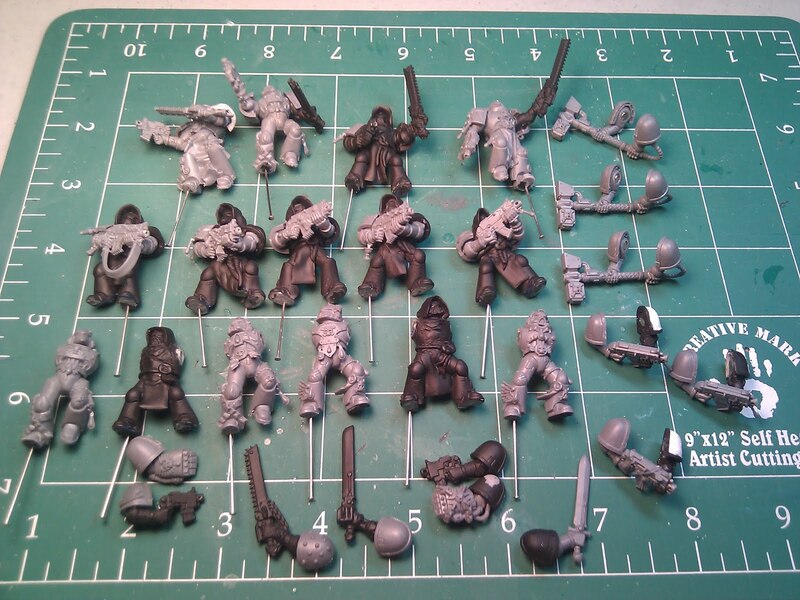 Razorback foot sloggers with Thunder Hammers and Plasma Weapons? 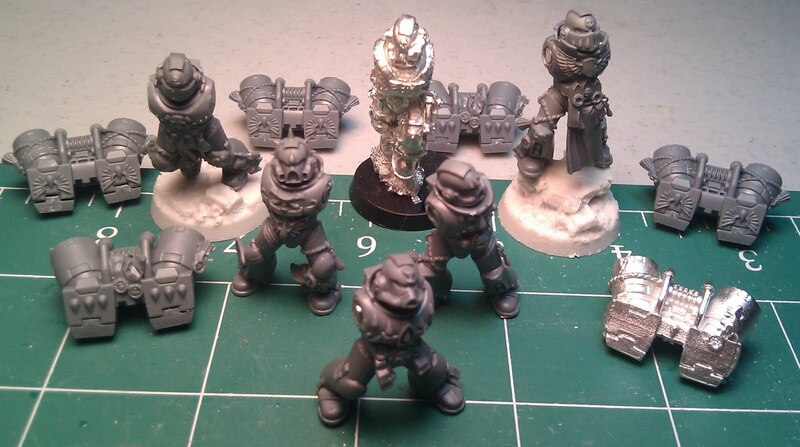 Or just Honor Guard with Maxxed Melta Death to rain down as a nut cracking unit with attached Priesty love? There is always more then one way to skin a cat, lets count the ways. I am all for Hobbyist cheapness and reuse of models, so I embrace the world of magnetics. 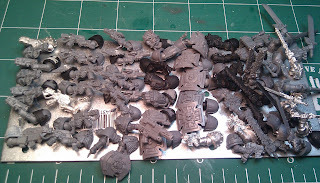 In my Angels Sanguine army I have a huge aray of magnets in my marines. Everything from power fists, to chapter banners are magnetized, especially my magnetic baals and my magnetized razorbacks/vindicators. 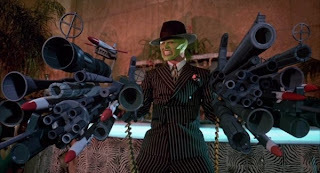 As you can see here, all of my weapon options are magnetized at the shoulder, allowing most, or all configurations of armaments for all my special troops. 7 Hand flamers, 6 Infernus pistols, 7 Plasma Pistols, 1 Combi Plasma, 1 Combi Melta, 1 Pointing hand, 6 Power Fists, 6 Storm Shields, 1 Combat Shield, 11 Bolt Pistols, 5 Glaives Encarmine, 4 Power Swords, and 8 Chainswords - All options for my Honor Guard, Vanguard Vets, and Sergeants. So, When it comes to specialty units the follwing are always points of contention in my mind, and as shown on forums and in army lists, everyone has their opinion. Round 1: Assault Squad, Seargents, and Special Weapons. I also would opt in a Hand Flamer with the Seargent if I have spare points. As I have magnetized Seargents, I could swap out with an Infernus but I belive that the Infernus bonus is negligible compared to the fist, and the fist/flamer combo. Any comments on Infernus use on Seargents? This is a tricky one. I have found three primary roles for this unit. Tar pit unit. Storm Shields And Meltaguns. Same variation, but add some Storm Shields. If the points are there. Are mellee based Honor Guard units a good idea? I mean, with only five wounds they probably fit the Shooty role better, as close range support. I plan to field the Meltagun version primarily. The four Plasmagun or plasma pistol Idea has been thrown around. Anyone had any practice with that, FnP and Plasma looks good on paper. There are plenty of camps on the simple idea of their usefulness in this codex, cost, and Jetpack price are big factors. 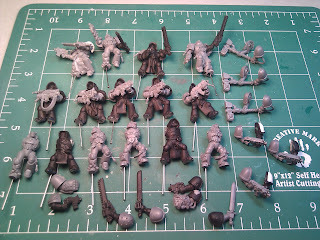 Nevertheless I have 15 death company marines made up for my Angels, as I love the idea, and I plan to have at least two Death Co. Dreads, so I will need at least ten models to unlock them. Question is Loadout. I can easily see DC being used with a stormraven and maybe an IC or Chaplin to accompany them along with the DC Dread. However I would need two of those, and that puts the list revolving around two killer units that can't score, plus needing Astrorath to split the units into two. One nut with AstroNut and another with Lemartes perhaps? Does anyone have any good plans with death company yet? Bolters. I love the idea of Relentless bolter DC rapid firing into a mob and then charging right into them. I would not deploy all as bolters, but at least three to five in a bigger DC. Hammers and Fists. If the DC runs into a Vehicle or big baddie, this will come in handy. I would take at least one hammer and probably one fist as well. Power Weapons. I have seen a few lists with multiple power weapons in them. Vanguard Vets are becoming more commonplace in all jumpers lists as they add that Heroic Intervention punch that most jumper or reserve armies lack. I still have not been sold on these units. I plan to eventually have two units available, but currently only have 5 at my disposal. As far as VV vs. HG, does anyone out there have any hard feelings towards one verses the other? I keep reading them setup as an effective first strike CC units with HG or Regular Assault troops for the cleanup. So as you can tell, I have put thought into leaving my options open, but not much idea on which direction to go. I am a fan of flamers for rank and file Assault troops, and the Powerfists always look like fun. Let em know where I may be going wrong, or right.